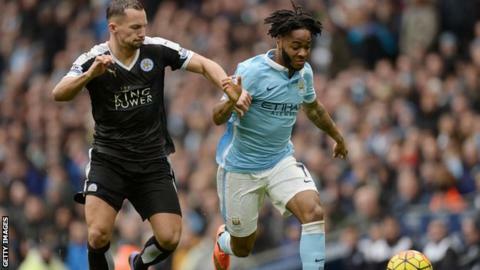 Leicester's Danny Drinkwater says it would be "one of the best years of my life" if he won the Premier League and represented England at Euro 2016. Midfielder Drinkwater, 26, has been called up to the national team for the first time for friendly matches against Germany and the Netherlands. His club side are five points clear at the top of the Premier League. "If it does happen, as far as football seasons go, it is mad, it's special," Drinkwater told BBC Radio 5 live. Drinkwater has played an integral role in Leicester's sensational title challenge, appearing in 29 out of 31 games in the top flight. He ranks as the division's top tackling English midfielder, while his 1596 passes is fourth most for an English midfielder behind Bournemouth's Andrew Surman, Everton's Gareth Barry and Eric Dier of Tottenham. He was named in the England squad last week. "It has been a bit crazy," said Drinkwater. "When it was announced, it was a bit of an emotional day for family, friends and my girlfriend." "The day the list was released, I did not know what to think. I was all over the place. We have had our first training session. Now I am ready to crack on. "I am buzzing. It is every lad's dream. If you ask any young kid if they want to play football for your country, they would snap your hand off." What about a fairytale finish to the season with a winner's medal and call-up to the European Championship? "It sounds exactly how I would want it to end," he said. "Personally, it would be one of the best years of my life." Drinkwater started his career at Manchester United but failed to make a first-team appearance. After spending time on loan at Huddersfield, Cardiff, Watford and Barnsley, he joined Leicester, who were then in the Championship, in January 2012. "I wasn't playing week in, week out for Manchester United, I was out on loan a lot," said Drinkwater. "In that situation, it is tough to think about playing for the national team. I left United and the dream went further away, but I have worked hard to get it closer." Tottenham's Harry Kane - once a Leicester loanee - leads the league's scoring chart with 21 strikes, but Foxes frontman Jamie Vardy has 19. Asked if the two players have discussed the race for the golden boot, Vardy replied: "We don't talk about anything like that when we are here. We just know we are here to focus on England in the next two games. "That is all we are going to work on and how to get results in those games."